Many physicists are doing research into semiconductor quantum dots, small crystals in which quantum mechanical characteristics play a clear role. It might be possible to use these dots in future quantum technologies. 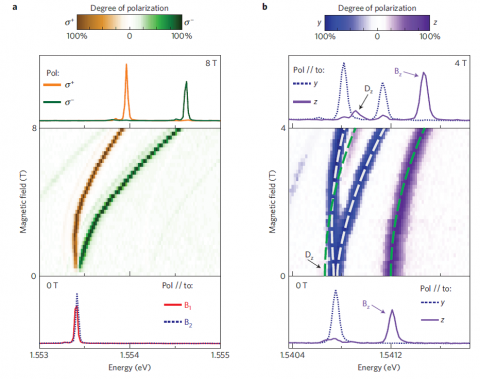 This year the research group of Dr Val Zwiller managed to create quantum dots that trap excitons: bonded pairs of electrons and holes (the holes are in effect 'missing' electrons, which for the purpose of calculations can also be viewed as particles). The researchers used light holes, instead of the usual heavy holes. The heaviness of a hole is determined by its effective mass, in other words how easily the hole moves under the influence of an electric field. The quantum dots with light holes have several advantages for quantum information technology, for the manipulation of quantum bits and for the coupling of electrons to photons. The European collaboration between the groups in Delft, Dresden and Linz, resulted in publications in Nature Physics and Nature Photonics. The researchers produced the dots with light holes by making use of ‘pull-and-stretch engineering’. With this method the researchers made non- stretched quantum dots on membranes that were stretched. They then removed the membrane from the underlying substrate as result of which the quantum dots were stretched with the membrane. Due to the stretching, the characteristics of the quantum dots changed from those of a dot with a heavy hole into those of a dot with a light hole. By placing the membrane on a piezoelectric substrate, which deforms under the influence of an electrical potential difference, the researchers could increase and decrease the stretching force. That allowed them to vary the characteristics of the quantum dot at will. 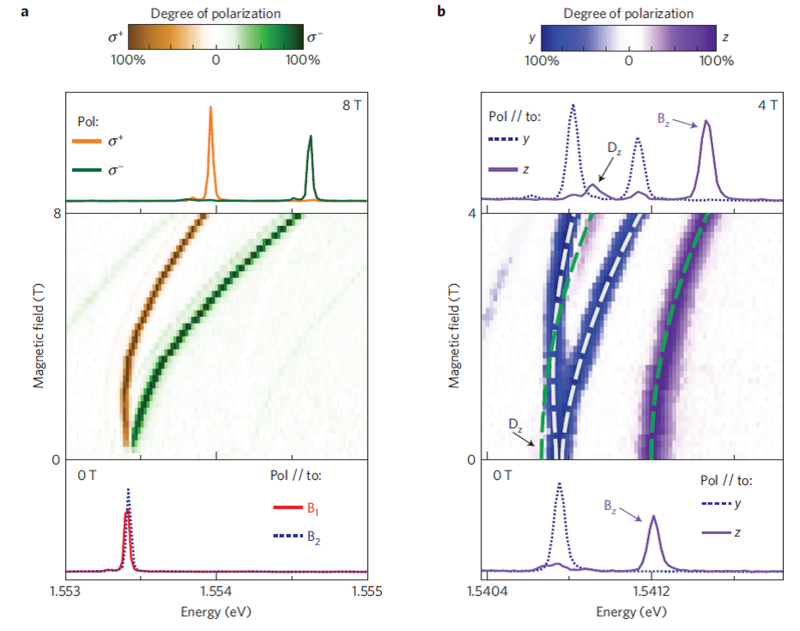 The quantum dots were studied optically in a magnetic field, as a result of which the characteristic energy levels of the excitons could be determined. The authors have shown both experimentally and theoretically that the quantum dots with a light hole are clearly different from those with a heavy hole. For example, with the light hole variant it is possible to change and control spin states (the rotational direction of particles) much faster. Schematic representation of the quantum dot. The observed radiation transitions are dependent on the magnetic field. From this the researchers recognised that the transitions must have been the consequence of light holes.